When you try to goto the Shop screen on your Nook First edition, black and white reader, it flickers and then goes back to the main screen. The Nook is stuck in a loop where the Shop never displays. Regardless of the issue you have with your Nook, here are some Resets you can try. Bear in mind these actions will change data on your device, so if you can, backup your device before messing with it. Goto Settings–>Device–>Unregister Your Nook. Confirm. Then Goto Settings–>Device–>Reset To Factory Settings. Confirm. With your Nook powered on, hold the back-page button on the right side of the Nook, the one that looks like this: <, while also pressing and holding the Power button at the same time. If you elect this option, your device will be wiped completely, including software updates which were applied after you setup the device. Sometimes this is the only way to get the reader working again. Just note, this will result in you losing all your sideloaded content and you will have to re-download your library, which could take a while if it’s suubstantial in size. Make sure your Nook is fully charged or plugged into the wall. Very Important! Turn off the Nook by holding down the Power button on the top. When you see the screen go blank white, press and hold the Power button until the screen flickers black for a moment. Continue to hold the button for a slow count of 12-15 seconds. You won’t see anything on-screen, but the animated arrows may stop. Repeat Step #2 a total of 6 more times. Once you’ve done that, you can turn your Nook back on. Once it boots into your main screen you’re ready to re-register it and re-connect it to the WiFi. Once you have a WiFi connection, goto My Library, in the My B&N Library section you will select the “Check for new B&N content” button. 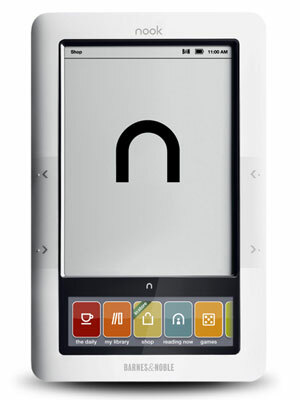 The Nook will check for the latest software update and automatically install it for you. The 1.7.0 update (latest update as of this blog posting) is 62MB in size so it will take some time to download and even more time to install, so be patient. That’s it! Hopefully your Nook works properly now. Note: See this link for more info from BN about your first edition Nook.